A marine biologist at Plymouth University will be hitting the nation’s television screens this week in a ground-breaking documentary on sharks in British waters. Dr Nicholas Higgs, a Research Fellow in the Marine Institute, was a consultant for Britain’s Sharks, which airs on ITV1 on Friday, and features a unique experiment in which a humpback whale carcass is towed out into the deep sea. The film crew was able to document an unprecedented number of Blue Sharks feeding on the whale, some three metres long, before the carcass was sunk into the depths for ongoing study. Nick, an expert in ‘whale falls’ – the process by which creatures of the deep, such as zombie worms, thrive on whale carcasses – accompanied presenters Ben Fogle and Ellie Harrison during the filming in the Celtic Deeps, an area located between the coasts of Cornwall, Wales and Ireland. “When a whale dies it can float for weeks, and be carried along by the current for miles while being fed on by scavengers. Elsewhere in the world, we know that a huge range of animals will come in to feed, everything from Great White Sharks to tiny little worms. But we’ve never had the opportunity to study one in the UK because when a whale washes up, it is taken to landfill. We had no idea what might come along to the feast." The nine-metre humpback whale in the programme had tragically drowned last year when it became entangled in a line. After a post-mortem by vets, the team worked with the relevant authorities to return the whale to its natural habitat, rather than see it end up as landfill waste. After four days at the surface, an estimated 200 sharks had consumed 15 per cent of the whale, ingesting some two million calories. The animal was then sunk and came to rest 86 metres down, where Nick’s time-lapse cameras will take one photo every hour for the next six months. 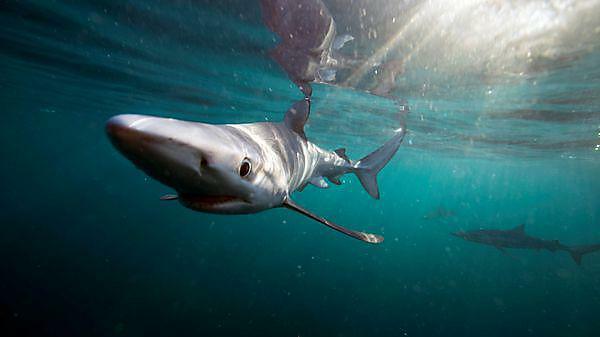 Britain’s Sharks is broadcast on Friday 25 March at 9pm.